Now one day he began to paint a picture. A dark force moved him, because he was full of dark forces. He wanted to represent, to cube really, the essential likeness between the nature of chives and the female soul. In theory the whole problem was solved. He saw the emptiness that fills both these objects precisely and with total intellectual clarity. There is more to genius than intellect, however, and, when he connected the herb’s snake-like form with the previously mentioned soul, his unusually developed instinct gave him mystical knowledge. No genius would deny a certain complement of mysticism. Our Heavenlykingdom was deeply wounded by something he had also heard about from his fellow men: although these little women are often really tiny, they can still not be shaped and modelled into the form one needs for physical and psychic comfort. Had he been a writer, he would have been compelled to enrich literature with a ponderous work on the theme, “When you go to Woman, do not forget the whip.” But under the circumstances that you know about now, his painting was to be called, “The Chive and the Female Soul: A Comparison.” I think it was already announced for exhibition, while the canvas still shone blankly, spotlessly receptive. One has to do everything in good time. Gotthold—that was Heavenly kingdom’s first name—suffered under the female soul in the totality of his manhood. And we all need to confront what makes us suffer. No wonder, then, that Heavenlykingdom (secretly) began to think of himself as on a level with a redeemer—let’s admit it, with Christ—because of the likeness he has discovered. But you have to imagine the painting properly—as it were, a scientifically dissected representation—the female soul, totally clear in a segmented cubist painting—so that everyone able to adopt an abstract point of view could read, there she is, that’s her innermost being. And next to that the analogy and parallel: chives. Wouldn’t everyone see it as clear as day? We also know that when we recognize what ails us, we are cured. So what perspectives would open up with the creation of this painting? Wouldn’t the most burning question of our time be solved? Yet we have had to admit too often that theory and practice don’t coincide. He had worked on his picture for two years and two days already. He laboured and laboured mightily, unable to advance beyond the chives. In the first place, the painting remained green. As soon as he used a different colour, the disturbance that resulted was so great that he covered it with green again. For a while he thought that the treacherous female soul (treachery no doubt its most important element alongside emptiness) could appear as a cubist lemon-yellow spiral among the green—a shape more or less like one of those sofa-springs that winds crookedly upward. But alas, painting is colour as well as form. The yellow refused to meld with the massive green of his chive allegory. He had no choice but to remove the winding spiral. A painter must remain enough of an aesthete to refuse to paint badly for the sake of his idea. The same thing happened with the composition. He tried and tried, even falling into trances, but nothing beyond the dull repetitive up-and-down of the chive motif would develop. Over and over again he hoped to fix the damnable female soul in a fluted doughnut-shape. But his eye remained objective and told him the truth without pity: this fretwork muddies the powerful melody of the chive movement. His most intimate friend, looking at the painting, remarked that it had the kind of power that liberated itself in an overwhelming sense of bore … No, that’s not what he said. He said, liberates itself in sameness. Then he decided with a heavy heart to abandon the female soul and to devote himself only to chives from now on. They say the State bought the painting for the National Gallery. They say that when its creator was asked for the title, he omitted mention of the chives and proudly called it “The Female Soul. ” They say Gotthold Heavenlykingdom will be the next candidate for a Nobel Prize. In this bitter and amusing short story Hannah Höch describes the ego of the male painter, Gotthold Himmelreich, which translates as God-Beloved-Heavenly-Kingdom, who seeks to capture “the essential likeness between the nature of chives and the female soul” in a painting entitled, Das Schnittlauch und die Seele des Weibes (ein Vergleich) –The Chives and the Female Soul (a comparison). Hannah Höch studied at the Berlin School of Applied Arts from 1912 and the Museum of Applied Arts in Berlin from 1915, where she met artist Raoul Hausmann. She contributed to the Berlin Dada Group and exhibited at the First International Dada Fair in Berlin in 1920. Höch’s work was defined as degenerate (Entartete Kunst/Degenerate Art) in Germany during the 1930s. Höch’s work has been exhibited internationally with a retrospective at the Musée d’Art Moderne de la Ville de Paris, and the Berlin Nationalgalerie in 1976. The Beauty of New York. Franz and Sabina would walk the streets of New York for hours at a time. The view changed with each step, as if they were following a winding mountain path surrounded by breathtaking scenery; a young man in a black suit directing an invisible orchestra while crossing the street; a fountain spurting water and a group of construction workers sitting on the rim eating lunch; strange iron ladders running up and down buildings with ugly red façades, so ugly that they were beautiful; and next door, a huge glass skyscraper backed by another, itself topped by a small Arabian pleasure-dome with turrets, galleries, and gilded columns. She was reminded of her paintings. There, too, incongruous things came together: a steelworks construction site superimposed on a kerosene lamp; an old-fashioned lamp with a painted-glass shade shattered into tiny splinters and rising up over a desolate landscape of marshland. And she recalled her first mature painting, which came into being because some red paint had dripped on it by mistake. Yes, her paintings were based on ‘beauty by mistake’, and New York was the secret but authentic homeland of her painting. Didn’t they then at last agree on something? No. There is a difference. Sabina was very much attracted by the alien quality of New York’s beauty. Franz found it intriguing but frightening; it made him feel homesick for Europe. Part 6. The Grand March. Chapter 11. But the people who struggle against what we call totalitarian regimes cannot function with queries and doubts. They, too, need certainties and simple truths to make the multitudes understand, to provoke collective tears. Sabina had once had an exhibition that was organized by a political organization in Germany. When she picked up the catalogue, the first thing she saw was a picture of herself with a drawing of barbed wire superimposed on it. Inside she found a biography that read like the life of a saint or martyr: she had suffered, struggled against injustice, been forced to abandon her bleeding homeland, yet was carrying on the struggle. ‘Her paintings are a struggle for happiness’ was the final sentence. She protested, but they did not understand her. Do you mean that modern art isn’t persecuted under Communism? My enemy is kitsch, not Communism!’ she replied, infuriated. From that time on, she began to insert mystifications into her biography, and by the time she got to America she even managed to hide the fact that she was Czech. It was all merely a desperate attempt to escape the kitsch that people wanted to make of her life. Part Six. The Grand March. Chapter 11. The trees were her playmates, the twittering of the birds her music—all the wild things of the forest loved her, specially dogs and children. She knew every woodcutter for miles round by his Christian name. “Why, here’s Madcap Moll!” they would say, as the beautiful girl came galloping athwart her mustang, untamed and headstrong as she herself. This, then, was the priceless jewel which George I., spurred on by an overmastering passion, ordered to be transferred from its rough and homely setting to the ornate luxury of life at Court, where he immediately bestowed upon her the title of Eighth Duchess of Wapping. It was about a month after her arrival in London that Sir Oswald Cronk painted his celebrated life-size portrait of her in the costly riding-habit which was one of the many gifts of her royal lover. Sir Oswald, with his amazing technique, has managed to convey that suggestion of determination and resolution, one might almost say obstinacy, lying behind the gay, devil-may-care roguishness of her bewitching glance. 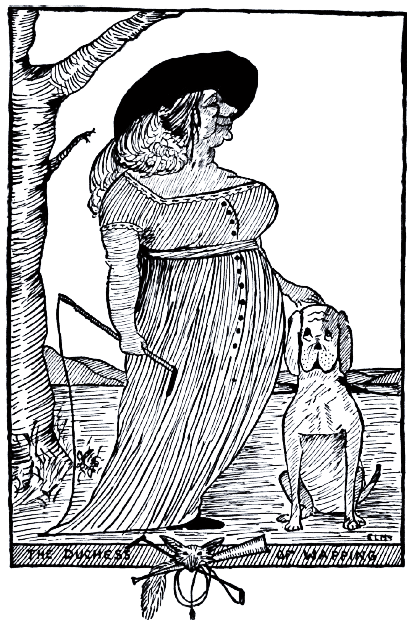 Her slim, girlish figure he has portrayed with amazing accuracy, also the beautiful negligent manner in which she invariably carried her hunting-crop; her left hand is lovingly caressing the head of her faithful hound, Roger, who, Raymond Waffle informs us, after his mistress’s death refused to bury bones anywhere else but on her grave. Ah me! Would that some of our human friends were as unflagging in their affections as the faithful Roger! , From the pastel by Coddle.